We have been examining the problem (If resource allocation from the point of view of an individual fin. Let us widen the horizon and try to see how the resources of the entire economy can he most efficiently utilized. What. in other words. is the criterion for the optimum utilization of the country’s resources? In a free enterprise economy, this important function is performed by the resource prices. 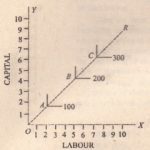 For attaining maximum efficiency of resource allocation, there is constant shifting and reallocation of resources between different uses in response to changes in people’s tastes and preferences, changes in the category anti .the quantities of available resources and changes in techniques of production. Resource prices furnish the mechanism for rectifying localisations of the resources in the economic system. Criterion of Maximum· demode. Thus, the criterion for a correct or efficient utilization of resources is that the net national product has been maximized. i.e at the existing technology it has attained a peak level. Conversely, the resources will not be correctly allocated if tile net national product is below its potential maximum. However, in case of allocations, automatically such forces will be set in motion as will bring about a reallocation of tile resources so as to maximize the national product. Here is the traditional approach to the problem. 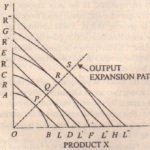 Thus, “the best allotting of tho factors of production is when the product a factor is the Sallie in line in which it is employed, or the equilibrium situation with regard to allocation of factors is that in which the unintelligent) places the same value upon marginal product If abductor in ever industry. (Ambien). The reshuffling of the resources as between different uses takes places through the mechanism of resource prices. When the value of the marginal product of a given resource is lower in some industries, it is clear that the firms will not be willing to pay for it more than the value of its marginal product. On the other hand, where the value of its marginal product is higher, the firms will be keen to use more of it and they will offer to pay a higher price which is above the value of i marginal prod i the fonder case. The owner of resources sinus their incomes . I tr fer I (ROM the remunerative to the more remunerative uses. This transfer will continue till the value of the marginal product is equalized in all uses. When equality between the values of marginal product has been attained, the resources will be making the maximum contribution to the net national product. Alluvium. The following statement clinches the issues underlying an efficient utilization of the resources: Efficient transformations arc those in which cerise caribous: (I) it is not possible to increase the amount of any output without increasing the amount of some input or decreasing the amount of some other output; (2) it is not possible to decrease the amount of any output without reducing the amount of some input or increasing the amount of some other output. All others arc inefficient.